There are a large number of stylistic variations of Civil War shoulder straps. These are best illustrated by colonel's straps because the designs of the eagles give the embroiderer the best opportunity to show off her art. The written regulations governing colonel's shoulder straps were not altogether specific. 1540. For a Colonel--the same as for a Major-General, and bordered in like manner with an embroidery of gold; a silver-embroidered spread eagle on the center of the strap; two inches between the tips of the wings, having in its right talon an olive-branch, and in the left a bundle of arrows; an escutcheon on the breast, as represented in the arms of the United States cloth of the strap as follows: For the General Staff and Staff Corps--dark blue; for Artillery--scarlet; Infantry--light or sky blue; Cavalry--yellow. Even so regulations were often not followed and it is difficult to find a strap that absolutely conforms to the written regulation. The above strap is regulation, but not typical. Typical Civil War colonel's eagles are larger than the regulation two inches. The wings of the above strap are formed from sequins and cable pattern (entwined) bullion embroidery. The direction that the eagle's head faced was not specified by the regulations, but the straps were commonly in pairs with both eagles facing the wearer's front. The above strap was one for the wearer's left shoulder. The regulations state with which claw of the eagle should hold the arrows and olive branch, but even that varies in our examples. The two above straps, both identified to known Civil War officers, have a single regulation one-quarter inch border. The wings do not conform to regulation in that they are larger than two inches wing tip to tip. Sequins were often, but not always used by the embroiderer to form the wing feathers, but on these examples they were not. The staff strap is made in a manner similar to the way major's leaves are made. The cavalry strap has only cable pattern wings. Multiple bordered straps were extremely popular during the Civil War and only uncommonly used afterward. The above straps are typical of double border ones with sequins used to form the wings similar to the first example. This is a miniature cavalry colonel's shoulder strap that measures one-and-1/16 inches by three inches. The underlay is not turned under and this is very similar to a series of straps that the late Duncan Campbell acquired at the liquidation of the firm of Stokes-Kirk and donated to the National Museum at Gettysburg. The underlay is uncharacteristically ragged and some of the Jaceron wire is missing from this specimen. However, the eagle is well detailed in high relief, the field is yellow velvet and the border is mixed bright and dead bullion typical of Civil War manufacture. Miniature shoulder straps are offered in the Schuyler, Hartley and Graham catalog of 1864. This is a double bordered infantry colonel's shoulder strap that measures two inches by five and 1/8 inches. There is no underlay. The borders are made from mostly dead bullion but there are double strands of bright bullion repeated after every four strands of dead bullion in a regular pattern. The eagle is done in silver with sequins forming the lower parts and silver bright bullion the upper parts of the wings. The eagle's tongue is accented in red thread. The blue of the field is rather dark but not dark enough for the strap to be called staff. 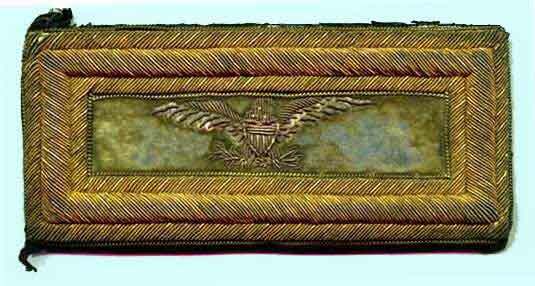 This is a triple bordered infantry colonel's shoulder strap that measures two inches by four and 3/4 inches. There is no underlay. The two outer borders are made from dead bullion but there is a single short strand of bullion repeated parallel to the edge of the middle border in a regular pattern around the strap. The most inner border has a pattern of bright bullion repeating every 5th strand. The eagle is done in silver bullion without sequins. The eagle's wings slope downwards. The eagle's tongue is accented in red thread. During the Civil War there was an extreme variability in the overall construction and appearance of officers' insignia. The manufacture of insignia was basically a cottage industry with the suppliers contracting out bullion embroidery as piece work, resulting in wide variations in the final product.